Sunday, Aug. 28, 2016 ~ After a three-week postponement (waiting for mechanical issues to be resolved), former RCAF Air Gunner & POW Albert Wallace takes his first flight in a Lancaster bomber in over seventy-one years, since the one in 1945 that returned him to England following nearly two years at Stalag Luft III. That was the German prison camp best known today as the site of "The Great Escape", one of WWII's most famous ~ though for many of its participants, ultimately ill-fated ~ POW operations. This gallery also includes images from a talk in late April, 2016 at the Sunnybrook Veterans Residence in Toronto, the facility where, at age 95, Al Wallace continues to serve as a volunteer, helping support the needs of his fellow WWII and Korea-era vets. The talk was presented by Al and his daughter Barbara Trendos, and focussed on their book describing Al's WWII experiences. Also included are images from the Canadian Aviation Historical Society's Toronto Chapter Dinner Meeting in early May, where Al was presented with the "certificate" for this commemorative flight, which had been donated to the Chapter by the Canadian Warplane Heritage Museum in Hamilton. 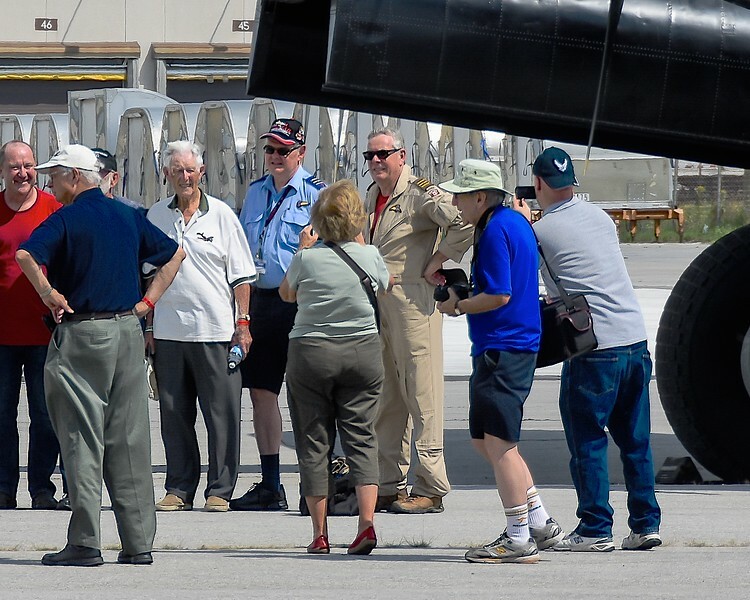 CWH is the proud custodian of this one of only two still-flying Lancaster bombers in the world today, and the only such aircraft in North America.